Whenever you see mold on your deck, you should act immediately to minimize damage and keep your deck looking beautiful for years to come. While conducting your seasonal deck maintenance, you might’ve noticed some mold popping up on or around your deck. Whenever you see mold on your deck, you should act immediately to minimize damage and keep your deck looking beautiful for years to come. Depending on the location of the mold, there are different maintenance steps your should take. If there is mold growing on the ground beneath your deck, it means that there is too much moisture in that area. Decks that are too close to the ground could be the cause of this mold, but the most likely cause of the mold is improper drainage or faulty grading. If your deck seems to be simply close to the ground, adding ventilation can alleviate the moisture buildup and prevent future mold and mildew problems. If that isn’t the issue, you should call a professional contractor like Atlantic Maintenance Group to evaluate the situation and make recommendations. Suggestions could include adding a drainage system or re-grading the landscape so that water and moisture can’t accumulate. If there is visible mold or mildew on your deck, you should be quick to act, but not quick to panic. This is a very common problem for almost every deck owner. For wood decks, neglect of your maintenance is the most likely culprit. If you haven’t treated the deck or properly cared for it in a long time, the deterioration is has probably penetrated below the surface. Examine your deck thoroughly for any signs of rot. If there’s no rot, you can hire a professional to remove the mold and help restore your deck back to top condition. Once you treat the issue, take steps to prevent it by treating the deck every five years. For composite decks, mold or mildew issues can be more complex. Older composite materials faced major mold problems from the recycled materials used to make the composite. As long as you don’t have a very old deck, that probably isn’t your problem. 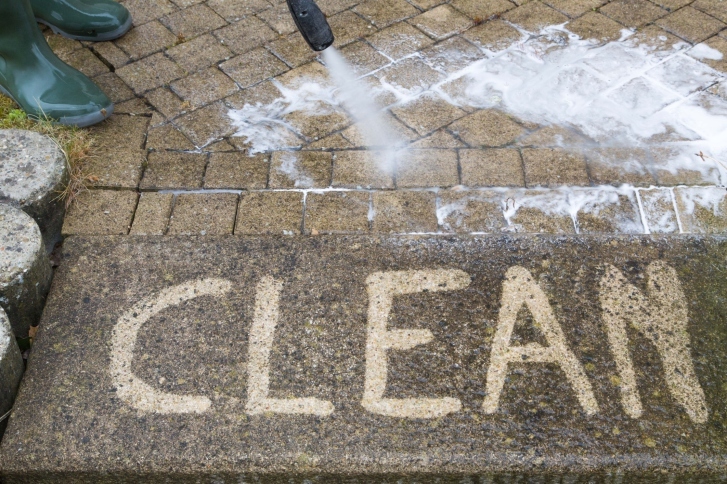 If you have deck mold to remove, get ready for a couple afternoons of scrubbing with a stiff brush and a deck cleaner with Sodium Hypochlorite. Once the mold is gone, keep your deck looking good all year long by regularly cleaning it with your garden hose and a high-pressure nozzle. If you are looking for help getting rid of the mold problem above or below your family’s deck, Atlantic Maintenance Group is ready to help you with our variety of landscaping, asphalt, snow removal, and concrete maintenance services. We are experts in our field and we are prepared to meet your needs with a price and product that will leave you grinning. If you’re interested in getting a free quote or more information, visit us online or give us a call at (410) 768-4720. To see examples of our work and stay up to date on our specials, follow us on Facebook, Twitter, Pinterest, and Google+. This entry was posted on Thursday, July 21st, 2016	at 8:58 pm	and is filed under Blog, Landscaping Maintenance	. You can follow any responses to this entry through the RSS 2.0	feed. Both comments and pings are currently closed.